Educator Support Services are designed to help local educators, classroom teachers, and homeschooling parents serving children and teens by providing materials and group visits for their students. Teachers and homeschooling parents may request a group visit or materials for their classrooms by calling 303-LIBRARY (303-542-7279) or online through the Educator Support Inquiry. A librarian will contact you within 48 hours to confirm your request. You can also search our Educator Collectionopens a new window for materials to check out. 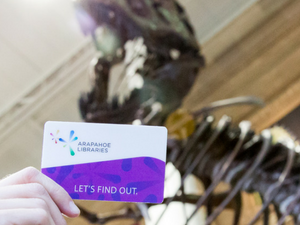 Material Requests are available to any educator with an Arapahoe Libraries card. We will set aside or place holds on items to support a curriculum unit or area of study. You may request materials by individual titles, or you may request a general subject area, and our librarians will select titles for you. To request materials, please fill out the Educator Support Inquiry and allow 2 weeks for your materials to be gathered. Any group may come for a self-guided, unscheduled visit at the library at any time. If staff assistance is requested for a visit at the library, for a storytime or tour, please request a scheduled visit through the Educator Support Inquiry. In addition, local schools and organizations may submit a request that a librarian visit your facility using this same form. School visits to support the Summer Reading Program are scheduled separately in February and March for April and May visits. View our Educator Collectionopens a new window for materials to check out. Request an Ask a Librarian session. View our online Homework Help Databasesopens a new window. Request materials with our Need Suggestions form. Further your own learning by checking out our Online Learning Courses. Some of these courses offer Continuing Ed credits.